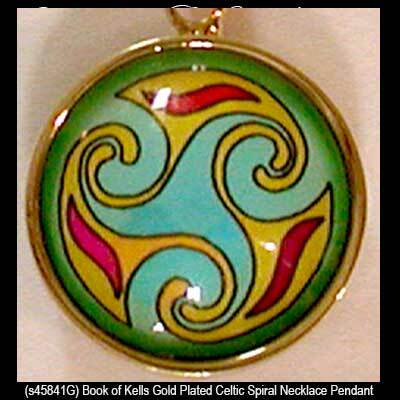 Book of Kells jewelry is based on the Celtic illustrations found in the 8th century Book of Kells, Ireland's finest national treasure. 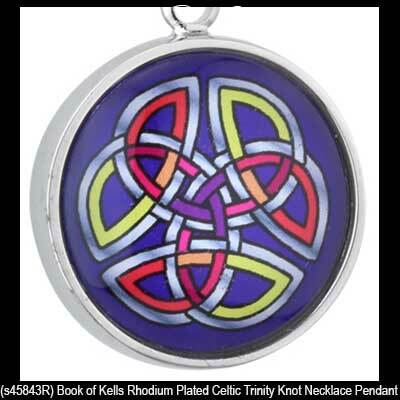 Trinity College in Dublin, Ireland has licensed Solvar to create the Book of Kells jewelry collection that ranges from beads to necklaces. 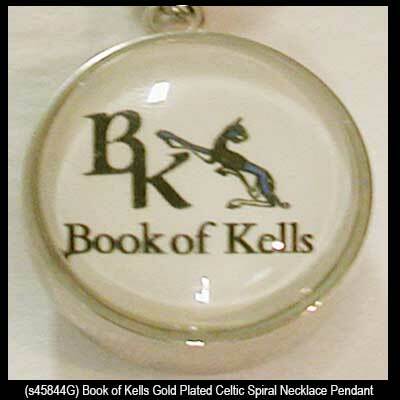 The Book of Kells is a richly decorated manuscript containing the four Gospels of the New Testament. 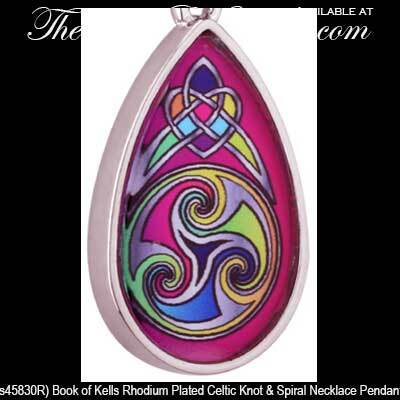 It is believed to have been transcribed by Irish monks around the year 800 AD and it is a magnum opus of calligraphy and represents the apex of enlightenment. 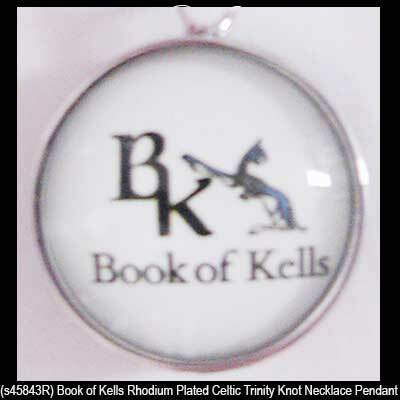 The Book of Kells received its name from the Abbey of Kells where it resided for centuries; today it is on permanent display at the Trinity College library in Dublin. 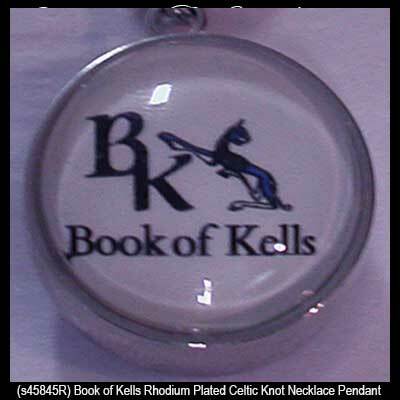 Generally considered to be Ireland's finest national treasure the vibrant illustrations and ornate embellishments in the Book of Kells exceeds that of other Gospel books in profligacy and intricacy by combining traditional Christian symbols with Celtic knots, animals and legendary beasts. 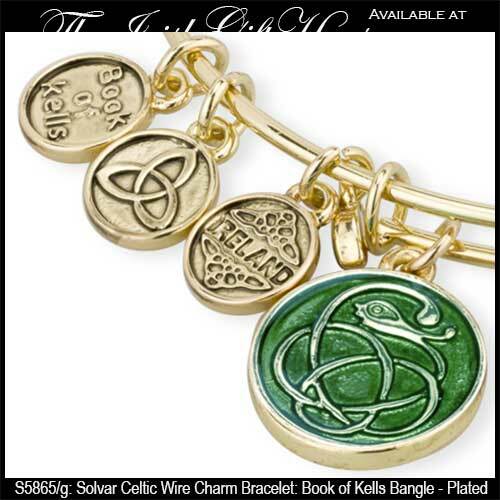 This Celtic wire bangle is a gold plated expandable charm bracelet with a Book of Kells Celtic charm. 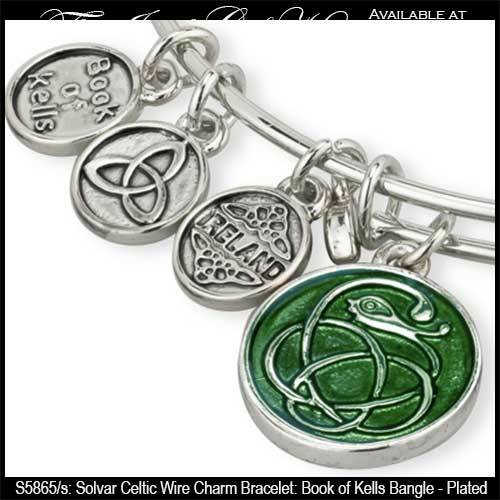 This Celtic wire bangle is a rhodium plated expandable charm bracelet with a Book of Kells Celtic charm. 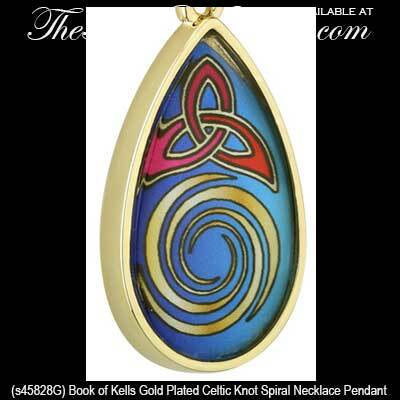 Book of Kells gold plated Celtic spiral brooch from Solvar. Celtic cross brooch is finished in rhodium plating and features a design from the Book of Kells. 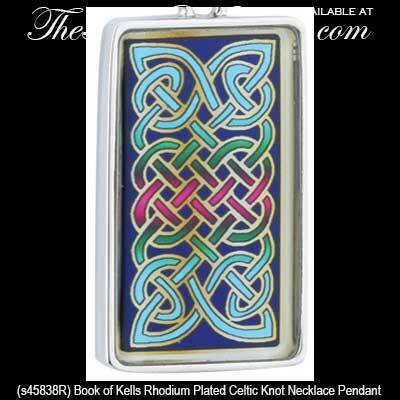 Book of Kells, rhodium plated Celtic knot brooch from Solvar. 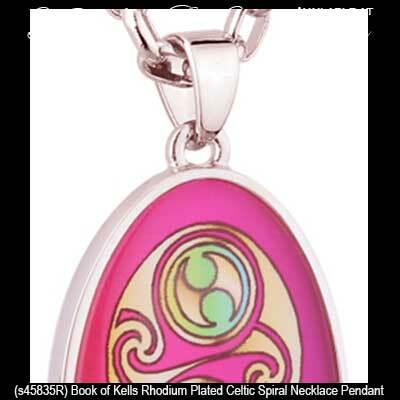 This Book of Kells necklace from Solvar features an enamel Celtic knot design and a rhodium plated finish. 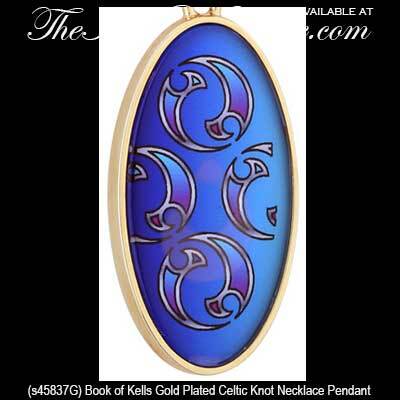 Gold plated Book of Kells necklace from Solvar features enamel decoration. 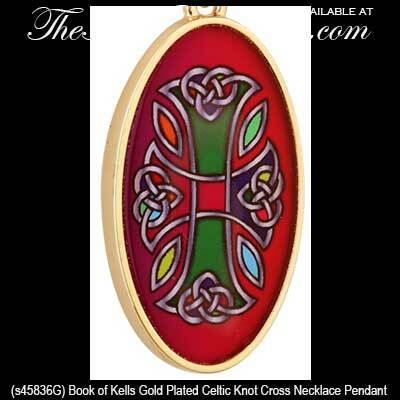 This gold plated Book of Kells necklace features a Celtic knot cross and is decorated with enamel. 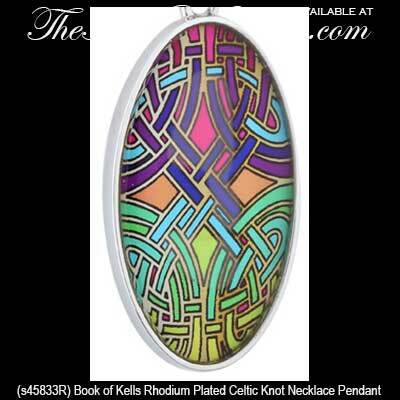 This Book of Kells necklace features an enameled Celtic knot design and the oval pendant is finished in rhodium plating. 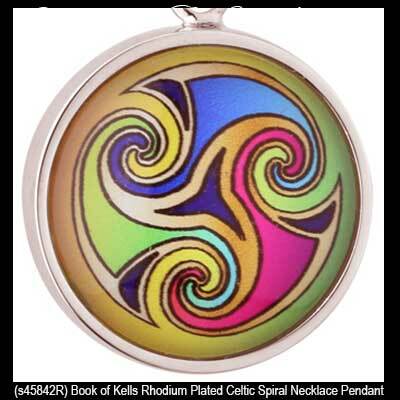 This gold plated Book of Kells pendant is enriched with both a Trinity knot and a Celtic spiral design. 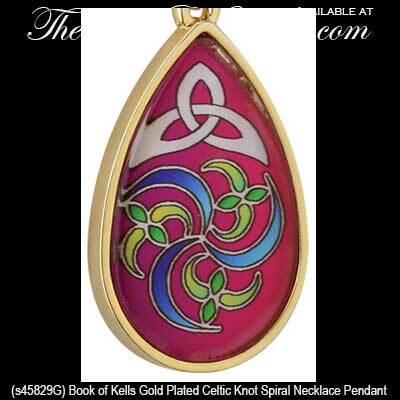 This gold plated Book of Kells necklace is enriched with both a Trinity knot and a Celtic spiral design. 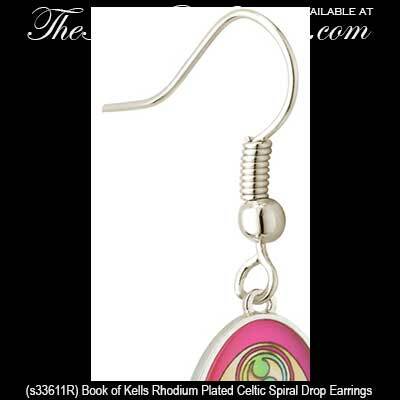 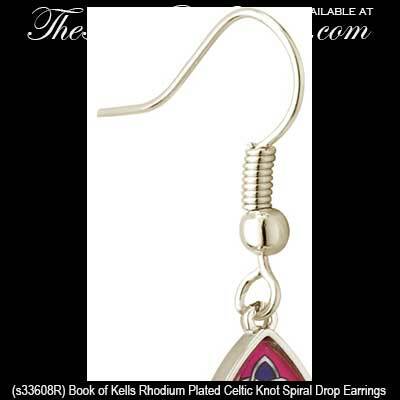 These rhodium plated Celtic earrings are designs from the Book of Kells. 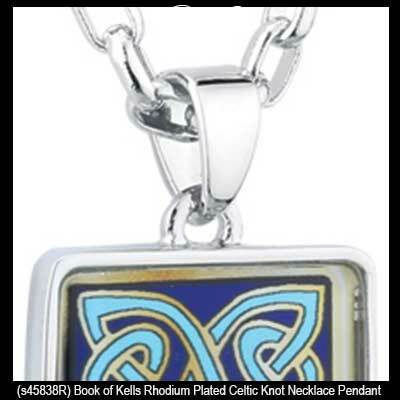 Throughout our site you will find thousands of examples of jewelry with traditional Celtic designs; this includes the collection from the Book of Kells. 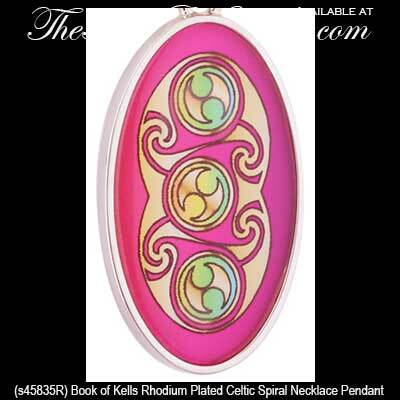 Other prime examples are the warrior Celtic shield wedding bands whose design is inspired from the Ardagh chalice which is another of Ireland's treasured artifacts. 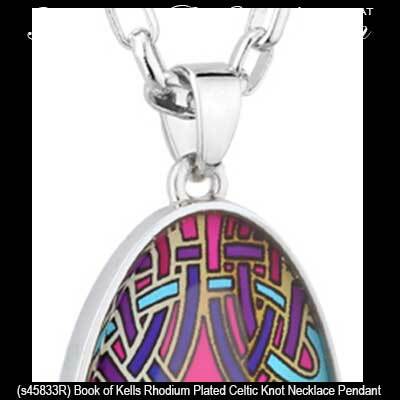 The ancient stone Celtic cross monuments that dotted the Irish landscape are the inspiration for the design found in most of our silver Celtic cross necklaces and our Celtic wall crosses and the tri spiral design found in Co. Meath is the catalyst for the Newgrange jewelry. 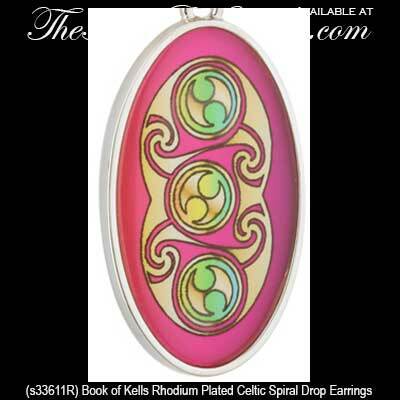 It was the ancient druids who espoused that the tree is the source of all life; today that Celtic tradition lives on in the symbolism of the Tree of Life necklaces and Tree of Life earrings. 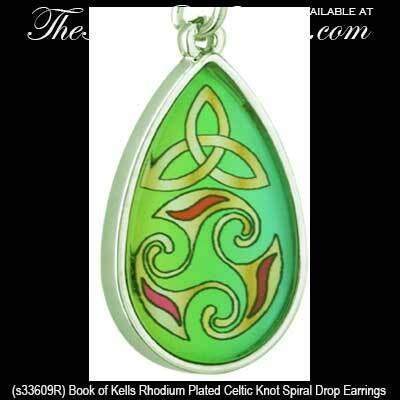 The Irish jewelry designs are just as evocative when you consider the gold Claddagh rings are based upon a 16th century legend that only grows in popularity throughout the world. 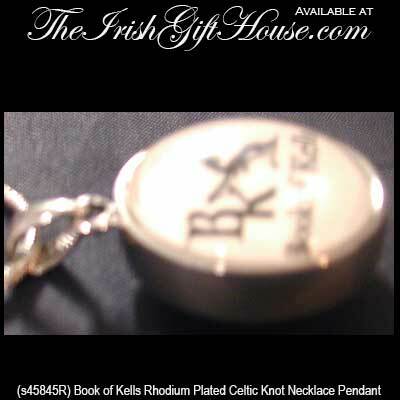 The tiny shamrock was revered for its mystical qualities long before St. Patrick used the symbolism of this three leaf clover to explain the concept of the Trinity; today as one of Ireland's national icons, you may find it as splendid silver shamrock necklaces and gold shamrock earrings. 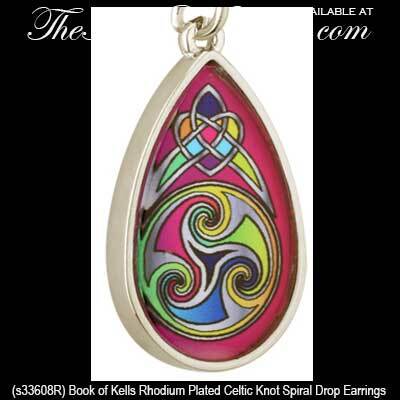 At 600 million years old, the most ancient and possibly most stimulating of all our Irish jewelry is those pieces with Connemara marble which is often referred to as Ireland's gem stone. 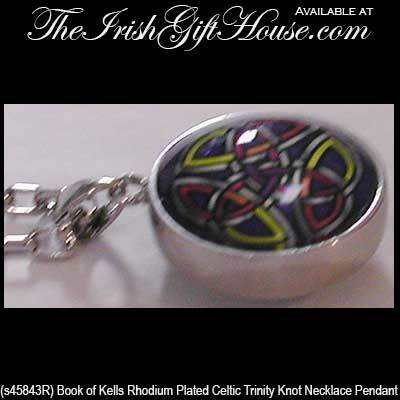 The Irish Gift House features an extensive collection that includes Connemara marble rings and Connemara marble bracelets. 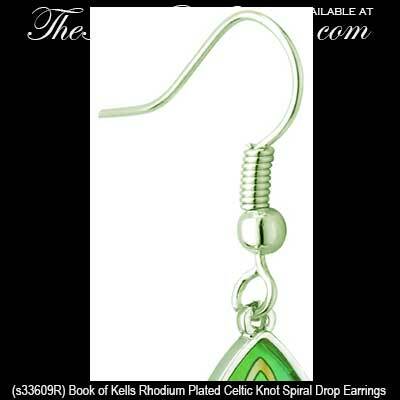 You will also find this iconic green stone accenting necklaces and earrings that are enhanced with various Irish or Celtic designs. If you are intrigued by the Celtic designs from the famous Irish manuscript you may like to take a look at our Book of Kells Irish whiskey glasses that are made in Ireland by Mullingar Pewter.